Andrew Greenbaum and Ian Felton have partnered to create Pom Pom, a company that makes art-based, functional pool toys. 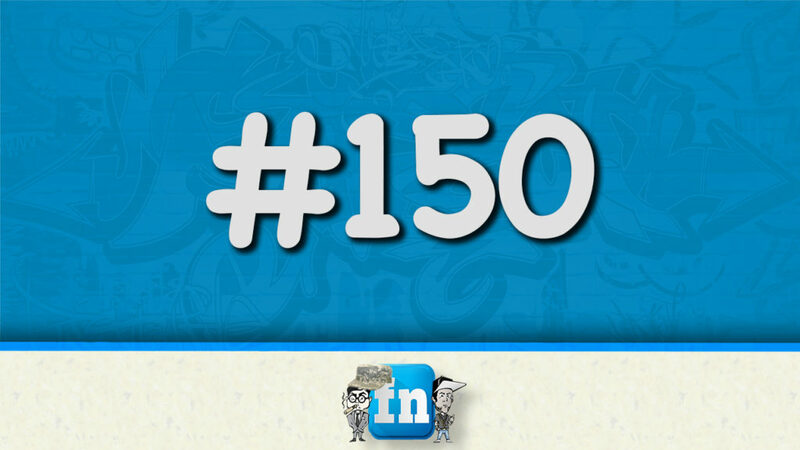 In other words, they are creating fun, satirical, and strange concept product designs that you you can actually use. 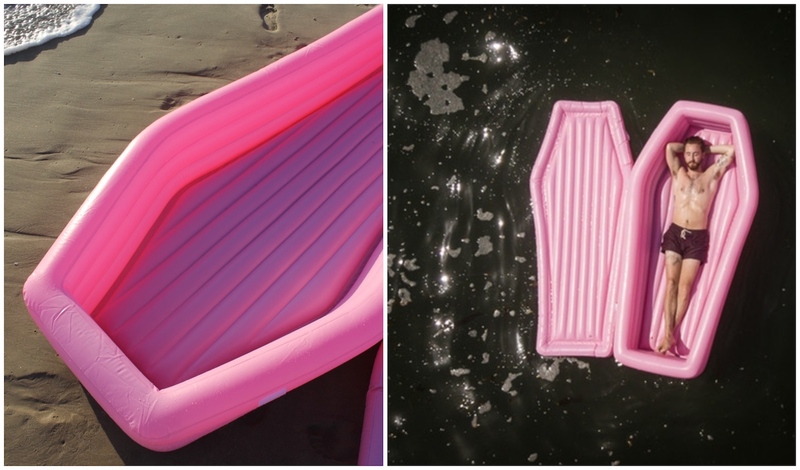 After three years in the making, they’ve released a full-size pink inflatable coffin. Yeah, you read that right. The pool toy can withstand the rough ocean seas or a rowdy day at the pool. Once you’ve had enough human interaction, just shut the lid for some peace and quiet. Not only does the coffin block out pesky nieces and nephews, but it also blocks dangerous UV rays. Greenbaum and Felton are both industrial design veterans and have worked for many years in a variety of design roles before launching Pom Pom. The guys recently commissioned a prototype of the pink coffin, which gave them the opportunity to share pictures. Pom Pom says we can expect more head-turning things from them in the future. “We also wanted to design objects that could ultimately fall between the lines of commercial object and art—taken with a huge grain of Himalayan salt. We’ve got a lot more ideas for Pom Pom, so this is definitely not a one trick Pony,” Felton told Core77. One of these pink coffins can be yours for $120. If you’re feeling extra spicy, you can buy a gold or clear coffin for $399. If you want to support Pom Pom’s ideas, but can’t fork over more than $100, they are offering custom designed pink coffin shirts for $35. Pom Pom is on Kickstarter through August 10 and so far they have raised close to $10,000 of their $60,000 goal. 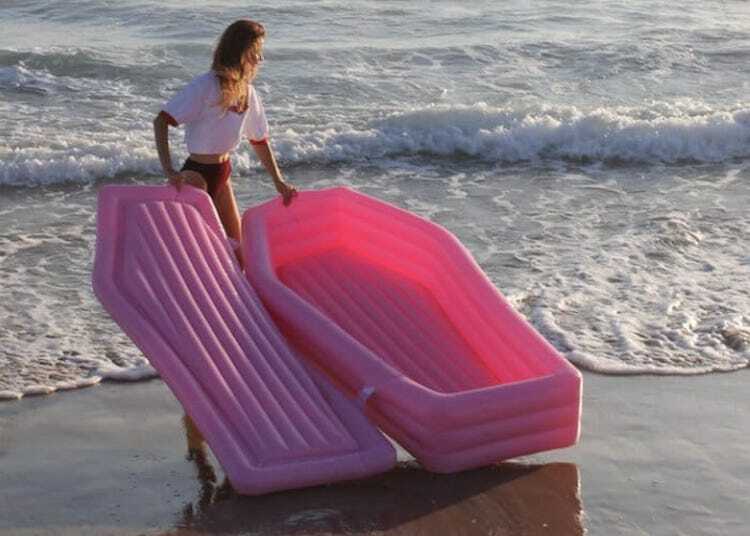 Click here to contribute to their Kickstarter for a chance to have your own inflatable coffin!